Judah Smith takes a radically different approach to wholeness that is ignored by many: everything starts with the soul. Judah Smith, New York Times bestselling author of Jesus Is ______, explores what it looks like to cultivate a healthy soul in the midst of a busy life and points readers to the soul's only true home and place of rest and fulfillment: God. It may seem like an odd question, but it's what pastor and bestselling author Judah Smith chooses to ask his friends, rather than "How are you?" It's a way to look past the externals and consider what's going on inside, in that essential part of us that is often overlooked in the struggle to make our way through everyday life. In the rush of living moment to moment, many of us find ourselves simply surviving, struggling daily with frustration, restlessness, boredom, and ever-fleeting joy. But if we would pause, we'd find that the things that matter most in life, what we are searching for in our busyness--stability, peace, hope, love--are rooted in the health of what Judah calls the "inside you." In How's Your Soul?, Judah explores that "inside you." Sharing his own, often humorous, mistakes and foibles, he helps us find our way through the emotional roller coasters of life to discover the soul-healing essentials of rest, responsibility, restraint, and relationships, all rooted in what he calls the soul's only true home--God himself. How's Your Soul? is an invitation to find lasting emotional satisfaction and stability by bringing our feelings into alignment with God's truth, moving beyond simply surviving, and learning how to live each day with eternal significance. How's Your Soul? by Judah Smith was published by Thomas Nelson in December 2016 and is our 15254th best seller. The ISBN for How's Your Soul? is 9780718088606. Buy Together Offer for How's Your Soul? Reviews of How's Your Soul? Be the first to review How's Your Soul?! Got a question? No problem! Just click here to ask us about How's Your Soul?. Five: Is Love God or is God Love? 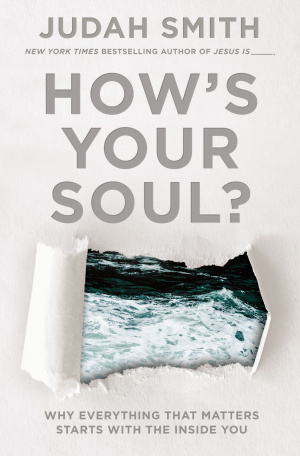 Details for How's Your Soul?